Since starting FulcrumTech, we’ve worked with numerous clients and prospects who have been frustrated by how to justify their email-marketing programs. Specifically, they want to know how much they’ll get in return from a certain level of marketing investment. Until now, there hasn’t been a way to accurately calculate email-marketing return on investment (ROI). To address this problem, FulcrumTech developed a sophisticated, web-based email ROI calculator called ROI GoalsetterSM. We designed it specifically to assess both current and future email campaigns. The resulting model lets you understand the growth and attrition of your email list — as well as your current and potential measurable returns — if you improve one or more factors, such as open rates or landing-page conversion rates. This powerful data can help you justify the expense associated with these improvements by showing expected ROI — something the C-suite (or whomever holds the purse strings) needs to see to approve your budget. 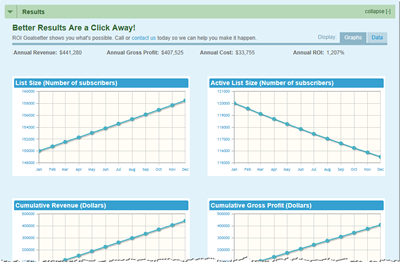 See my quick overview of the ROI Goalsetter tool below — what it is and why we created it. How Is Email-Marketing ROI Calculated? Email marketers have found that identifying and incorporating all of the components making up both return and cost is challenging. Furthermore, comparing historic email ROI to “what if” scenarios is also daunting. At FulcrumTech, we are fortunate to have an amazing math genius — who literally wrote over 100 calculus and statistics textbooks — to help bring all of our algorithms to completion so you can now leverage their power. Using the ROI Goalsetter tool’s data-entry wizard, you can quickly enter data about each of these factors affecting your email ROI. There are tool tips to guide you with industry benchmarks if you’re not sure how to answer some of the questions. Within just a few minutes, you’ll have a 12-month financial model of your email-marketing campaign. Then, you can easily use sliders (as shown below) to modify any of the factors — and see in real time the impact of your changes. 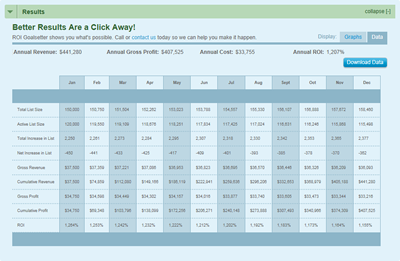 See a quick demo of the ROI Goalsetter tool’s features in this brief video. To learn more about each of the four categories and what your marketing management team can do to improve your email-marketing ROI, check out our free white paper for more details: How to Power Up Your Email-Marketing ROI. Prospecting — Prospects always want to know specifically what the value of email-marketing improvements will be. I use the model to demonstrate the current and potential situations. Then, with the ROI Goalsetter tool’s Compare feature, you can see exactly how much more revenue, profit, and ROI you can achieve from your proposed improvements. This is powerful! Planning — When running a business, if you don’t measure it, you can’t manage it. So if you develop an ROI scenario for the future, you can use that to establish your goals for improving each aspect of your campaigns that you envisioned would be improved. For example, if you know you need to take your unique open rates from 10% to 11.5%, on average, you now know your goal. Your designs, copy, and test plans then need to support a focused drive to improve to 11.5% because you know that’s what you need to meet your goals. Showing your coworkers, boss, and clients the data the ROI Goalsetter tool produces, you’ll be able to get them on board quickly…and get their support for the improvements you want to make. So, don’t waste another minute on developing a marketing strategy for email projects and campaigns without modeling them and predicting your email-marketing results. Try out the ROI Goalsetter tool free for 90 days and see what it can do for you (use the promotion code shown on that page by February 28, 2012). Once you check it out, please give us feedback. We want to hear from you so we can continually improve it for your benefit.